The Alicia Titus Memorial Peace Fund is proud to announce the fifth annual Season for Nonviolence initiative. Joined by Urbana University, a branch campus of Franklin University, and the City of Urbana, the 140th International City of Peace, this year’s Season for Nonviolence is taking place Jan. 30-April 4. The 64-day national educational, media and grassroots campaign is dedicated to demonstrating that nonviolence is a powerful way to heal, transform and empower our lives and our communities. The Season for Nonviolence was organized in 1997 to commemorate the 50th and 30th memorial anniversaries of Mahatma Gandhi and Dr. Martin Luther King Jr. With a growing foundation of support, the Season for Nonviolence has become an important educational and media opportunity to bring communities together, empowering them to envision and help create a nonviolent world, one heart and one program at a time. This year’s Season for Nonviolence kicked off this week with the Great Kindness Challenge. The Challenge is a bullying prevention program for Pre-K through 12th-grade students that creates a culture of kindness. Students are encouraged to perform as many acts of kindness as they can throughout the week. Last year, more than 4,500 students from the Urbana City schools, Graham Local, West Liberty Salem, and the Mechanicsburg School districts took part in this global event. Some schools chose to extend their week of kindness to one month, and many committed to practicing and promoting kindness throughout their entire school year. Our students joined with more than 10.5 million students in nearly 20,000 schools representing over 100 countries to carry out more than 500 million “Acts of Kindness” in just one week! Everyone in our Urbana City of Peace community is invited to join in the challenge and support our youth in their efforts to be kind. A family-friendly version” of the “Great Kindness Challenge” was created and used by more than 1,600 community members last year to provide ideas for random acts of kindness that can be practiced at home, at work and throughout our extended community. Visit the “Kids for Peace” (Great Kindness Challenge) website to download the Family Edition checklist at https://thegreatkindnesschallenge.com/familychecklist/. 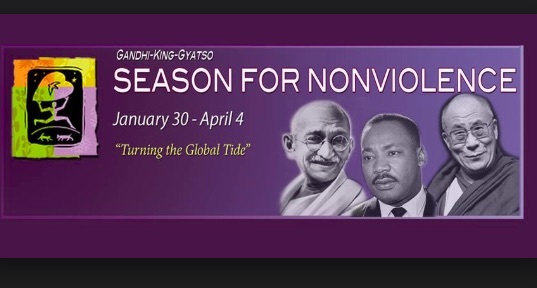 The 2019 Season for Nonviolence will include the International Cities of Peace exhibit displayed at Urbana University’s Sara Landess Room, Feb. 11-May 6. The Cities of Peace exhibit opens Feb. 11 at 5 p.m. with a panel discussion. The panel members include Fred Arment, Executive Director of the International Cities of Peace; City of Urbana Mayor Bill Bean; Bev Titus, co-founder of the Alicia Titus Memorial Peace Fund; and students from Urbana and Champaign County schools, to discuss local efforts to create a culture of peace within our community and support “Cities of Peace” around the world. The International Cities of Peace exhibit consists of 12 panels that represent “Cities of Peace” around the world as well as the newly designed Urbana City of Peace panel. The “Cities of Peace” exhibit panels address the issues of: what are Cities of Peace, are Cities of Peace important, what is a culture of peace, fostering our peace economy, and “International Cities of Peace” locations. The Cities of Peace exhibit will open Feb. 11 at 5 p.m. with a panel discussion. To conclude this year’s effort, the Alicia Titus Memorial Peace Fund will offer another free 6-week “Nonviolent Communication” workshop for community members, high school students and Urbana University students. Nonviolent Communication (NVC) is an approach to living that has roots in Gandhi’s teachings on nonviolence. The concept refers not only to physical violence, but also to any other way we “attack” others or ourselves, such as through judgment, criticism, and blaming. Many of us long to hold others and ourselves with consideration and respect, but we sometimes find it hard to live these values in daily life. NVC gives us practical tools for embodying these values in any situation. Diane Diller, an NVC trainer certified by the Global Center for Nonviolent Communication, will share how this practice helps us to communicate in a more loving and respectful way. The community is invited to attend these workshops Mondays, March 18 through April 22, from 6:30–8:30 p.m. in the Moore Conference Room, located in the Urbana University Student Center. To register for the Nonviolent Communication Workshop and find out more about the Cities of Peace Exhibit please call Stephani Islam at 937-772-9246. Space is limited and the class is free, so please RSVP.